Dr. John Placebo Hampton (1825-1907) was a physician in Madison County, AL He married 3 times, and lived a long and useful life. I have been in contact with a descendant of Dr. Hampton, who provided some wonderful family stories and photos (one of John P. Hampton provided below). From “The Confederate Veteran” Dr. John P. Hampton, one of the oldest and most prominent citizens of Huntsville, Alabama, fell asleep on June 8, 1907. Dr. Hampton was born in Lawrence County, AL, January 22, 1825. He graduated from LaGrange Military Academy. He moved to Monroe (now Clay) County, Miss, and while engaged in farming there he studied medicine under Dr. Clapp, graduating from the Pennsylvania Medical College in 1850. At the outbreak of the Civil War he entered the Confederate army as a private. He organized a company of infantry and was elected its captain. This became Company F, of the 43rd Mississippi Regiment, under Col. William H. Moore. He was in all of the battles fought by that regiment up until Franklin, Tenn., November 30, 1864, where he was severely wounded, losing his right foot, and he was made a prisoner. He was kindly cared for by Mrs. John McGavock, and while there, wounded and a prisoner, a lady cousin of his came, prepared to help him escape; but he refused to accept his freedom because his escape would have caused the removal of the other prisoners, many of whom were in such a critical condition that moving them would have been certain death. From the McGavock home he was carried to Nashville (where he received many kindnesses from Father Ryan), and from there to Camp Chase, Ohio, where he was still imprisoned when the war closed. He was made major just before the battle of Franklin, but was wounded and taken prisoner before receiving his commission. He was acting as lieutenant colonel in that desperate charge between the railroad and the pike. After the war Dr. Hampton with several others contributed several hundred dollars toward the expense of conveying and removing the Confederate dead from the battlefield to the McGavock Cemetery. In 1872 he removed with his family to Madison County, Ala., where he continued to reside until his death. He first married Miss Amanda Evans of Monroe County, Miss., who lived only a few years. His second wife was Mrs. Susan A. Burt, of Lowndes County, Miss., who died in 1856, leaving three children: John M. and William Burt Hampton and Madison County, Ala., and P.H. Hampton, now residing in Lincoln County, TN. In 1868 he married Miss Mary T. Battle (a cousin) of Madison County, Ala, who died in May 1884, leaving no children. Dr. Hampton’s grandfather, Samuel Hampton, who fought for American Independence, and Gen. Wade Hampton, of Revolutionary fame, were descendants of Sir John Hampton, from whom Hampton Roads receives its name. Dr. Hampton had in his possession several bonds of the State of North Carolina issued in 1780, which were given to his grandfather for services in the Continental army and which were never redeemed. His was a life as full of useful deeds and active good as it was of honorable years. He was a man who in all the relations of life gave his fellow-man an example of the ideal citizen. He always promptly answered the call of duty, bravely met the responsibilities of life and faithfully discharged them. He was not only a man of convictions but courage, yet was ever considerate of the opinions of those who differed from him. He was loyal to his Church, faithful to his country, true to his friends, obliging to his neighbors, devoted and tenderly affectionate in his family, and had lived, as he died, a consistent Christian. For fifty years he was deacon in the Baptist Church, and for twenty-one years he was Moderator of the Liberty Baptist Association. Twice he represented Madison County in the Legislature. He was a zealous Mason, for years serving his lodge as Worshipful Master. He was also interested in agriculture, and was President of the old Farmers’ Club of Madison County, and under his wise leadership his county for many ears won the first prize in the State fairs. The last seventeen years of his life were devoted almost exclusively to the service of his Church and the people of his county and State. He was intensely interested in the cause of education, and accomplished much in that line. He was a devoted Confederate and a member of the Egbert Jones Camp at Huntsville, and a faithful friend and subscriber to the Confederate Veteran from its infancy.” B.W.H. 3rd spouse of Dr. Hampton: Mary Thomas BATTLE (b.21 Feb 1844 m.1868 d.May 1884) called “Tommie” was the daughter of Josiah Davis Battle and Mary Elizabeth McCrary. They had no children. 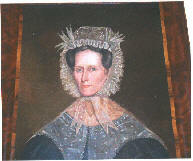 Susan E. Hampton (born ca1828/1831) married Van T. Chilton. 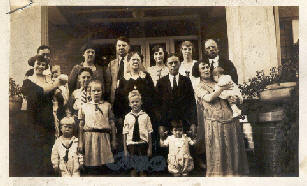 They moved to Missouri and, according to the hand written genealogy notes of Sue Chilton McClure Aldridge, they had no children. Matilda Hampton (b. ca 1833; died April 8, 1909 in Montana.) married Dr. William Parberry (12 Mar 1833; 17 Oct 1902) on 26 Jun 1872. 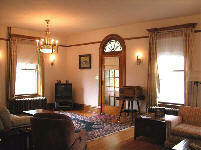 A biography about him gives additional information.... and pictures of their home “Parberry House” are provided below. Once again, according the notes of Sue McClure Aldridge, they had no children. The Helena Independent, "Mrs. Louise Mayn Remembers When It Took Four Women Before They Could Dance." "Interesting visitors from White Sulphur Springs, Friday, (portions not quoted) and Mrs. Louise Mayn. Few can remember more accurately than they local history they have helped shape, but they can not always be persuaded to recount it. The past holds hardships Mrs. Mayn does not like to recall. She can remember when we was one of four white women in Smith river valley. 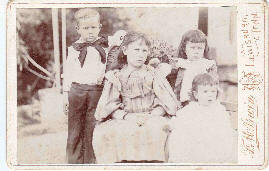 The others were Mrs. A C Kent, wife of Col. Gus Kent; Mrs. William Parberry, whose husband laid out the townsite of White Sulphur Springs, and whose big residence, now occupied by R. T. Ringling's, still goes by the name of "the Parberry house"; and Mrs. Almon Spencer, mother of "Gid" Spencer. In those days the quadrille was a favorite dance and unless the four girls went to a dance, there was none! Sometimes for six months Mrs. Mayn would see no white women. Indians were everywhere. They crowded doors and windows in such numbers that in Mrs. Mayn's expressive phrase, "they darkened the houses." Judy Archibald provided this wonderful biographical piece about Dr. Parberry, and also pictures of their home in Montana. She also determined when both Matilda and William died. We thank her very much for the information! “Progressive Men of the State of Montana,” Mansfield Library, University of Montana. DR. WILLIAM PARBERRY: Pleasurable indeed it is to read the biography of a man who is an American of Americans and a loyal descendant of those who willingly fought for their country in its early struggles for independence and led with brave hearts the toilsome, dangerous lives of hardy pioneers. Such a son and man, inheriting the best of a long line of true- hearted ancestors, is Dr. Wm. Parberry, of White Sulphur Springs, Mont. Born in Bourbon County, KY, March 12, 1833, to James M. and Susan (Neubill) Parberry, descendants of Virginia stock from the very earliest days of colonial times, but of Scotch-English and Irish lineage, he came into the storied heritage of two brave grandsires of Revolutionary fame and of a father who was in the famous Battle of the Thames, between the American troops under Gen. Harrison and the English and Indian allies under Proctor in the war of 1812, where Tecumseh, the noted Indian chief, lost his life. 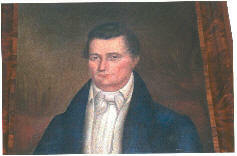 His parents were married in Virginia and moved to Kentucky in the year 1826. They later moved unto a farm about ten miles from Jefferson City, MO, his father dying there and his mother passing away at Lexington, MO. Dr. Parberry was reared in Missouri with few educational advantages, but determined and persevering, he continued through his hardships and limitations, studying often by the flickering firelight when tired with the day’s toil, until he was able to teach, securing his first school in 1854 at Jefferson City, MO. Soon afterward he began the study of medicine and took a course of lectures in St. Louis Medical College in 1856. He graduated from Jefferson Medical College of Philadelphia in 1858, returning to Missouri and practicing there until the winter of 1864, when he entered Bellevue Hospital Medical College. In the spring of 1865 he came to Montana, crossing the plains and located at Diamond City, then the county seat of Meagher county, where he was in active practice for many years. In 1877 he bought what was then known as Brewer’s Hot Springs, and laid out the town of White Sulphur Springs, becoming a prominent factor in its growth and present prosperity. 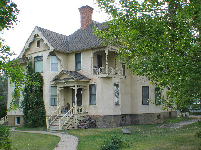 Here he still has his home, though he long since retired from the active duties of his profession, as well as from those of his extensive stock ranch of 15,000 acres in Sweet Grass county. Dr. Parberry has by no means confined his talents and energies to self-aggrandizement, but has served his city and state in prominent business and official capacities, which have not only made him well known as a man among men, but have conserved the best interests of the state. As president of the First National Bank of White Sulphur Springs, as assessor, county commissioner, city treasurer, a member of the territorial council in 1879, member of the constitutional convention, and senator from Meagher county to the First State Legislature, he has shown himself to be a man of versatile talent, of far-reaching insight into good government, of irreproachable honor and of unbounded liberality. Dr. Parberry’s political affiliations are with the Democratic party, which he has ever honored with unswerving loyalty and unstinted service. Fraternally he is a Knight Templar in the Masonic order. June 26, 1872, Dr. Parberry married Miss Matilda Hampton, of Alabama, daughter of Manoah and Cynthia (Mitchell) Hampton, of North Carolina, a lady of whom too much good can not be said and one in every way worthy the man whose productive and honorable life shines forth in the early history of Montana. As a physician Dr. Parberry had pre-eminently the courage of his convictions and advocated principles then greatly in advance of his time, but which strongly tint the trend of thought today, such as purity, simplicity, and an active out-of-door existence, either of hard work or of strenuous, exhilarating exercise. He believed that in a majority of cases the debility of the patient was curable through self-control, self-denial and active out-of-door life, rather than through the consumption of drugs, and unhesitatingly refused to administer medicine, often to his own loss financially, rather than assist nature to rebuild on a false foundation.